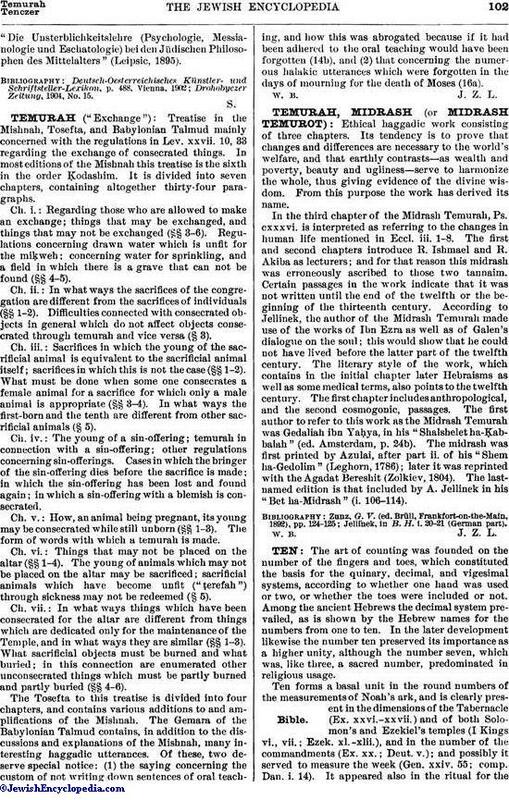 Ethical haggadic work consisting of three chapters. Its tendency is to prove that changes and differences are necessary to the world's welfare, and that earthly contrasts—as wealth and poverty, beauty and ugliness—serve to harmonize the whole, thus giving evidence of the divine wisdom. From this purpose the work has derived its name. In the third chapter of the Midrash Temurah, Ps. cxxxvi. is interpreted as referring to the changes in human life mentioned in Eccl. iii. 1-8. The first and second chapters introduce R. Ishmael and R. Akiba as lecturers; and for that reason this midrash was erroneously ascribed to those two tannaim. Certain passages in the work indicate that it was not written until the end of the twelfth or the beginning of the thirteenth century. According to Jellinek, the author of the Midrash Temurah made use of the works of Ibn Ezra as well as of Galen's dialogue on the soul; this would show that he could not have lived before the latter part of the twelfth century. The literary style of the work, which contains in the initial chapter later Hebraisms as well as some medical terms, also points to the twelfth century. The first chapter includes anthropological, and the second cosmogonic, passages. The first author to refer to this work as the Midrash Temurah was Gedaliah ibn Yaḥya, in his "Shalshelet ha-Ḳabbalah" (ed. Amsterdam, p. 24b). The midrash was first printed by Azulai, after part ii. of his "Shem ha-Gedolim" (Leghorn, 1786); later it was reprinted with the Agadat Bereshit (Zolkiev, 1804). The last-named edition is that included by A. Jellinek in his "Bet ha-Midrash" (i. 106-114). Jellinek, in B. H. i. 20-21 (German part).